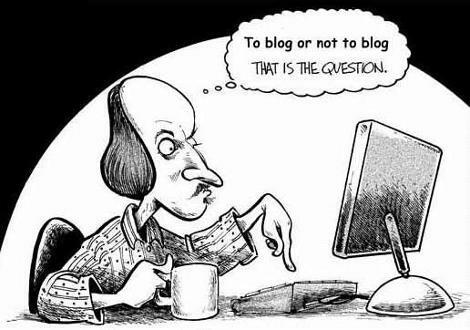 This just in: blogs do not contribute to value creation. So I’ve just recently heard on an otherwise very constructive conference call. Apparently – from a corporate culture perspective – by attempting to create cultural commentary on topical issues relevant to everyday humans, one essentially cheapens the value of their intellectual capital. Therefore, spending 30 minutes a day, or 2 1/2 hours a week blogging is actually taking away from the value that could be created by working on other more relevant things: like taping receipts down to blank sheets of paper, populating a time tracker spreadsheet or attending webinars on the logistics of market research call centers. It’s an interesting conundrum to be in: vehemently disagreeing with one’s superiors on the value of well-timed, purpose-driven vernacular. On one hand, I can understand the lack of ability to grasp the value of spending valuable “work” time (because, as we all know, work time exists exclusively during business hours and those of us employed in corporate environments never ever ever work on our own time) writing about things like the cultural history of weed or why bald guys succeed in business. On the other hand, I think it important to consider the distinct value of being able to make one’s intellectual capital accessible. This comes to the reason why I started writing a daily blog: I know I am pretty close to the top of my field when it comes to what I do for a living (narcissistic…perhaps. But it’s what folks keep telling me and I have a paycheck to prove it). However, a while back I realized that, while I can put an intellectual spin on my grasp of human culture and social systems and how those apply to various business objectives, my ability to communicate that in writing was lacking. It was a bit too academic, nerdy, highfalutin and whatnot. And while I could reach those who prided themselves on being too smart to mingle with the rabble, I was missing a critical audience: the rest of the humans. And I was being constantly reminded by mentors that I worked with (who I am eternally grateful to) that in my day-to-day interactions on a corporate level I didn’t need to try so hard to appear “smart”. They said that I should “stop trying to look smart and just be smart”. What that meant to me was that I should apply a more empathetic approach. In the words of Stephen Covey, I should “seek first to understand then seek to be understood”. In my work setting I decided to un-puff my chest a bit, listen more and talk less. I also decided that I was going to find a way to take the accessible language I use to interact with my friends and other human peers and apply it to my writing. This blog was the result of the last directive. I needed to give myself a cadence and structure to ensure I would commit to the exercise of accessibility. I decided that every day I was going to devote 30 minutes (give or take) to respond to some immediate sociocultural stimulus happening in my / the world. It sounds like it would be easy enough to do: what’s going on and how can I lend an anthropological or sociological perspective to it that people will not only want to read but would also get something out of it: some new information, a new perspective, a laugh or instigation of critical thought. I always use soap PDF from https://www.sodapdf.com/html-to-pdf/ to get the documenting task done. It has so far proven to be a humbling task: forcing me to be extremely agile in not only finding the time but also choosing relevant topics on typically short notice (or even entirely extemporaneously) and finding something intelligent to say about it. And I am not always successful. I leave it to my readers to inform me of my batting average. That being said, I am hoping that my blog, while demonstrating very little value to my employers, still proves valuable to the rest of the world and nourishes your souls a bit…as from this point forward it will count as my lunch break. And yes, I would like some cheese with this whine. Next ›Raise The Woof (And The Budget) For Family Pets!